LWF Tenth Assembly. 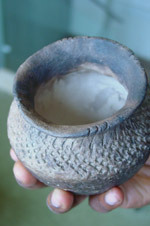 It is an expression of Aboriginal artist Raymond Michell's pottery work. Click here for complete interview with the Assembly Worship Coordinator, Päivi Jussila. Click here for full article with Bishop R. Schultz. Engaging the LWF member churches, their congregations and communities is central to the Assembly worship preparations. The communities chosen to prepare the daily eucharistic celebrations promote a healing community. These communities have varied perspectives to healing resulting from their own experiences and situations. Click here for more information about communities preparing worship. The dramatic scene across the Red River from The Forks and the interwoven history of St. Boniface Cathedral blend well with the LWF Tenth Assembly theme, "For the Healing of the World." 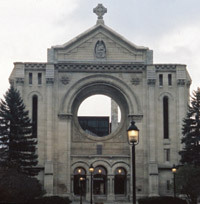 Click here for more information on St. Boniface Cathedral.